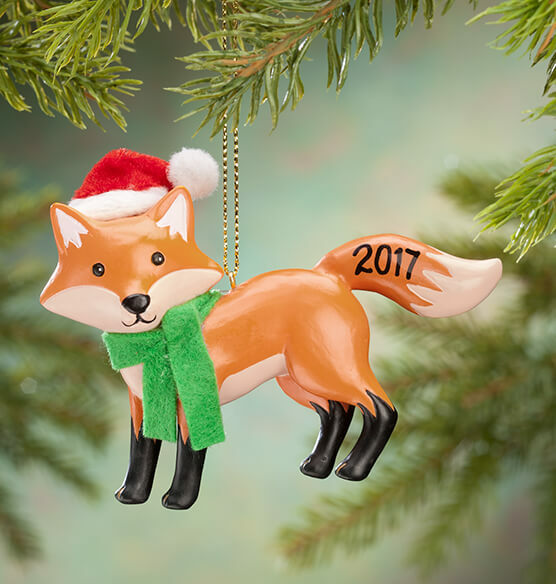 Decked in a plush Santa hat and festive green scarf, this Woodland Fox ornament is fun, festive and sure to inspire smiles. Perfect for animal lovers and kids of all ages, our exclusive 3D Christmas ornament is wonderfully detailed—and delightful from any angle. We'll add any year, creating a memorable holiday treasure. Specify year; limit 4 characters. Resin. Ornament measures 3" wide x 4" high. Very pleased with this 2016 fox ornament for our newest grand baby! Love it! Looks great on the tree!